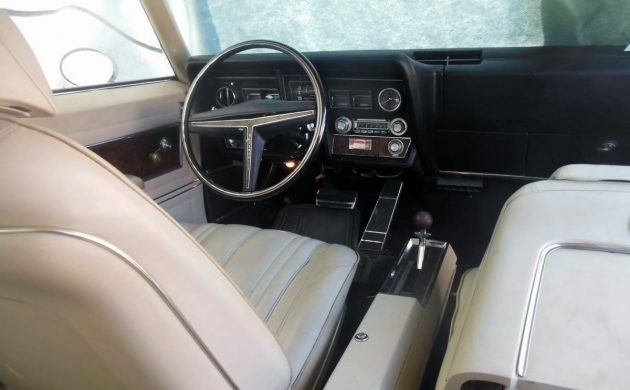 You were really something if you had a 1969 Oldsmobile Toronado back in the day. The ashtrays were probably filled with cigar or pipe ashes and there may have been a hat on the passenger seat. And I mean a real hat, not the ridiculous baseball caps that everyone wears these days but a hat-hat, a brimmed hat that real men wore and some still do. 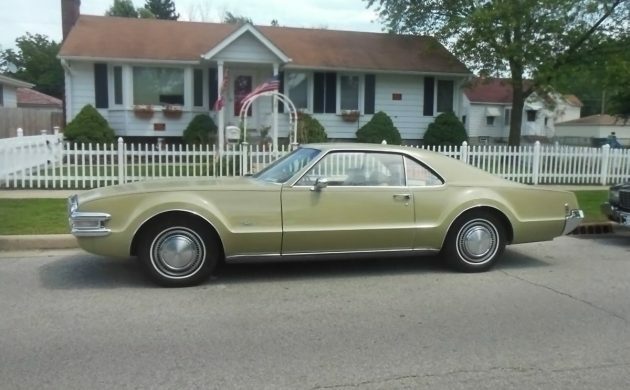 If you’re one of those people, check out this Toronado here on Craigslist in St. John, Indiana. 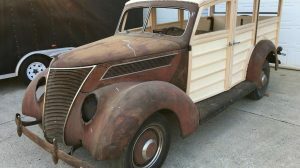 The seller is asking $9,000 or best offer for this beauty. Thanks to Pat L. for sending in this tip! I think that the first four years of the Toronado are the best but that’s just a personal opinion. 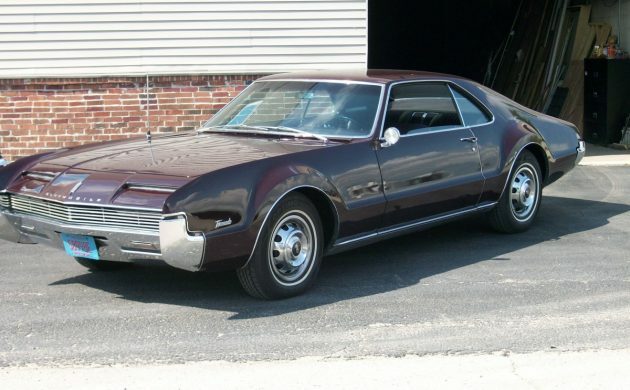 I love the hidden headlights and those went away in 1970, the last year of the first-generation Toronado. I also like that the first four years were front-wheel-drive. Ha, I was just seeing if you were paying attention, they were all front-wheel-drive! Seriously, though, what a great looking car. The seller says the “car has been gone thru mechanically” and they mention that it has new tires, brakes, tune-up, a new carb, etc. I like the sound of that. Hagerty is at $7,700 for a #4 fair condition car and $15,500 for a #3 good condition car. 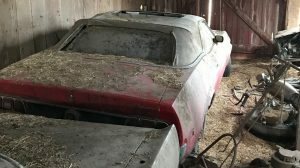 This looks like more of a good condition car to me from looking at the photos, but only a personal inspection will tell for sure. Either way, $9,000 seems like a good buy here. The interior looks gorgeous. There are a couple of tears in the driver’s seat bottom and there must be other things for the next owner to tinker with. It’s strange not seeing power windows on a luxurious car like a ’69 Toronado. You can see that these are bucket seats, yet another reason to like this car. The engine looks like it’s either brand new or has recently been detailed to within an inch of its life. Very nice! The blue may be a bit too bright for factory colors and the alternator will burn your retinas if viewed in the open sun but who cares, it looks clean and the seller says that it’s ready for a road trip. Nice job on this one, seller! 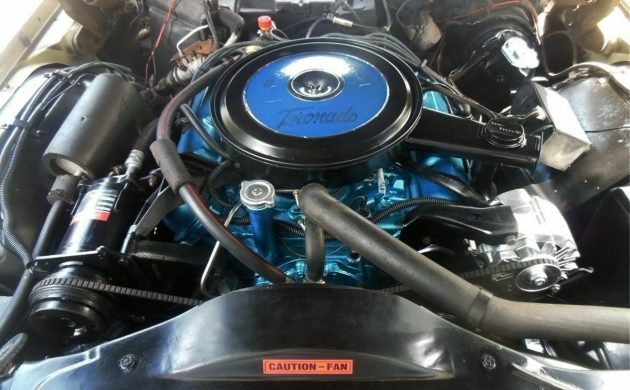 This 375-hp 455 cubic-inch V8 will absolutely get up and go but 10 mpg would be shocking to anyone used to driving a late-model economy car. Most of us realize that if we want a classic we have to pay the price to the gas and oil rulers, that’s just the way it is. I remember when my dad gasped because Premium shot up to $0.60 a gallon! If only, although comparatively, we pay more for coffee and/or bottled water than we do for gas. This looks like a beautiful example. Have any of you owned a first-generation Toronado? I haven’t owned one but I’d love to be wheeling this around town. Very sharp car! 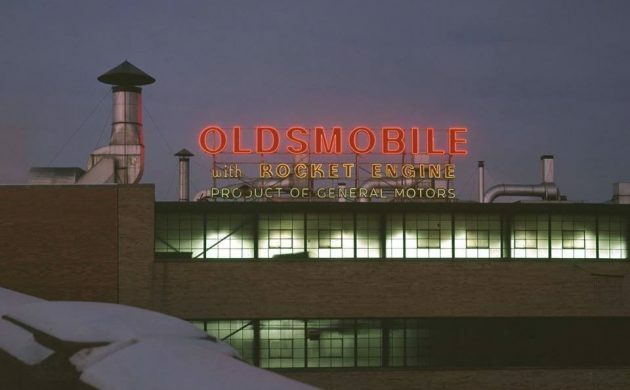 Looking at this beautiful Olds and thinking of all the Oldsmobiles my father used to own, (I had a couple myself) still makes me shake my head that this division of General Motors is gone. This is a well designed, powerful, luxurious car that just personifies class. Good luck to the new owner and keep this beauty as it is please, they don’t make them like this anymore…. What a beauty with the buckets and console…69 front grill is not my favorite. I would not have included the picture of the car on the lift and jack stands….acscident waiting to happen. I laugh to myself when I see 40+ hipsters with a hat 3 sizes too small. If you even attempted it today, the car might be totaled, certainly damaged a lot. The seller is “old school” for just owning that type of equipment! By the way, this can tow anything a pickup can. You forgot to add pulled down tight over their ears and backwards! My Dad was one of those brim hat wearing guys out of Mad Men.right up until the late seventies……. Sorry I had to laugh………..At Barrett Jackson? 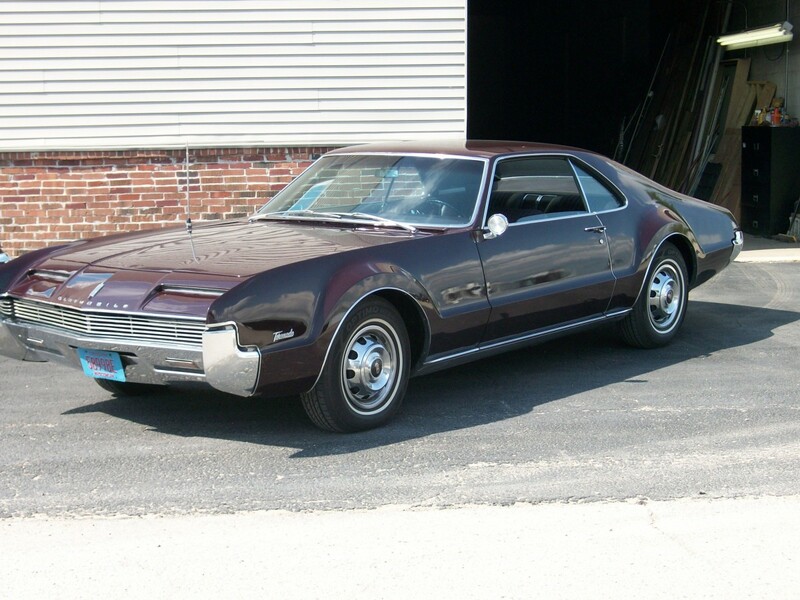 I had a 67 Toronado that I loved but finally sold in 74, and I would love to have this car. I am not as crazy about the colour, I liked the silver the best, but I would be quite happy to live with the present colours on the car. The 67 I had, was one of the best cars I have owned. 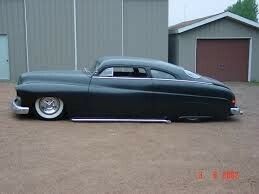 It is unfortunate that I don’t have a place for a car like this right now. That drivetrain in a GMC motorhome is known to get 10 mpg so perhaps more is achievable in the car. It is a long time to remember back to the late 60s, but I am almost certain that I was getting around 18 mpg, and about 17mpg with the air conditioner on. That was combination city and highway driving. The highway mileage was even better. That was with the 425 ci motor, so the increased displacement of this car would bring the mileage down some. We (my parents) had a ’68. I learned how to drive in that car. I loved the torque, the rumble, and the barrel speedometer. My friends (parents) in high school had smaller, mostly European cars that were absolutely more nimble on the canyon roads but could not keep up if there were any significant straights that allowed the Toro to stretch out. The ’75 that we got next was more luxurious, but paled in terms of power and reliability, and was the last GM product my parents bought. 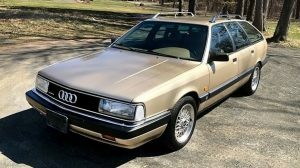 Same here… but my Dad kept buying GM, couple more Toronados and onto Eldorados and STS until his last car which I pushed him to buy an Infiniti. That took a lot of convincing to a WWII vet. Great car in not so great colors, the console makes it pretty rare, the buckets were a no cost option. It does not have the deluxe interior which is also rare, but less desirable. The engine paint looks like the right color – but not properly applied which would be less intense. Seller might want to mask off the spark plugs next time…price seems very fair if the body is as clean as it appears. Front wheel drive traction…a 455 V8… automatic on the console…clean condition..who could ask for more? We had a green Tornado when I was a kid growing up. Clearly my parents car since there were 11 kids and a station wagon to tow us around in. This car is without a doubt the one that started a life time of loving cars for me. I have owned multiple 66s, 67s, 70s, a new 73 and many in between….especially loved the early ones. I have a 70 GT but yhr tin worms have turned it into a parts car. Never saw one like this w buckets/console, but I hate the color. Look at what you used to produce GM! And now you make…..well let’s not even go there. I’ve always really liked these Toronados even tho they are not as vaunted at the 1st generation. The one to really get, if you can find it, is the GT which (correct me if I’m wrong) adds another 10-15hp. This particular one, in this condition, seems well priced. Beautiful! Scotty, your mention of the pipe ashes and hat are spot-on. Apparently my earliest word for “Grandpa” was “Hat” because only ne’re-do-wells would appear in public without one. Cars had to have “Hat Room” then for the gents and also the mile-high women’s hair-dos. It was a simpler time. 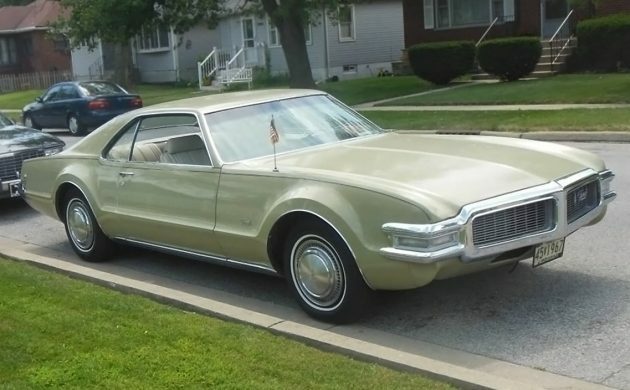 I chatted with a guy in a parking lot who had a Toronado about this vintage except with a factory three-on-the tree, one of 400? he said. The styling on these cars is unique and elegant. Thanks for sharing! While looking at this Toronado it reminds me of the Oldsmobile Administration Building with the giant rocket logo on it…..strong and powerful. 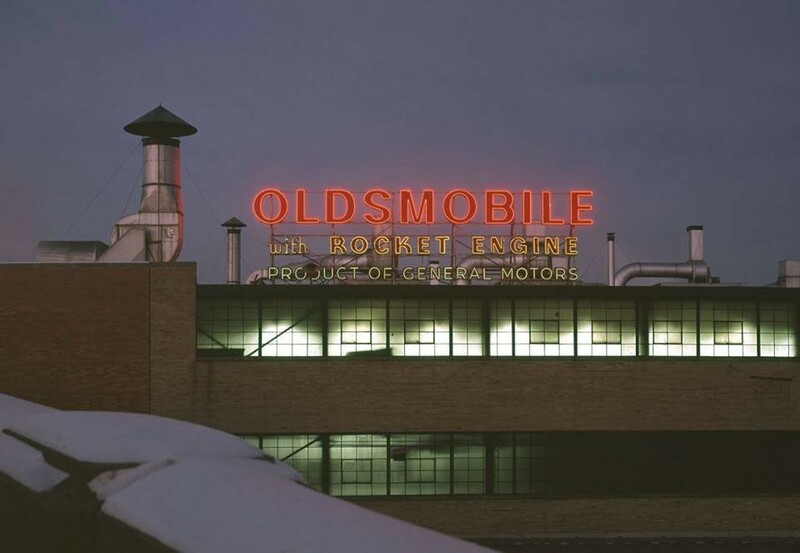 A sign of America and days gone by. Car looks to be a bargain at that price. Solid and in the color that was fashionable for its time. This model year was driven in Harold & Maude with Maude driving the &%$# out of it over country roads. This car is also in Killing Them Softly with Brad Pitt. Nice car, true about that old hat & cigar cliché stuff too. A friend’s father drove a 68 Impala two door green with a smelly cigar but no hat because he was not a businessman but a carpenter. My father wore those old hats with the rim but he drove really cheap Dodge & Fords his whole life. Can’t compare a full size GM to the economy class Dodge & Ford manufacturing at all. Robert White, I remember Maude driving a Buick Riviera, but not a Toronado. Are you talking about the scene where she finds the little sick tree and she has to save it? You are right about the Riviera she drives but the tree was saved when she stole the El Camino. In the movie she steals a Volkswagon Beatle, Mustang Fastback, Riviera, El Camino, and Harold’s Cadillac Hurse. One of the best classic car movies ever made IMHO. And of course who does not love Ruth Gordon after watching that movie? Robert, she first sees the tree when she is driving the Riviera. She takes it with the El Camino. Before anybody else does, I have to correct you. The word is spelled hearse, not Hurse. You have no idea how many times us hearse owners have to correct people on the spelling of this word. Also you forget that she stole the police officers motorcycle. That was funny. My mom had a 1969 in mink brown metallic with a black interior. It remains my favorite car that my parents ever had. Nothing will ever compare to cruising that baby through the McDonald’s parking lot on a warm summer evening with all the windows rolled down. The exhaust burbled like a Chris-Craft. At 10-12mpg that’s a memory best left in the vault. 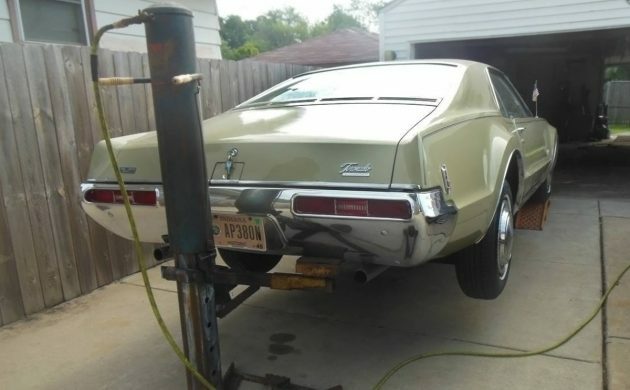 I remember growing up and reading Mechanics Illustrated with a new 1966 Olds Toronado on the cover. It took me 40 years to finally get the “right one”. …so many people in the same device. DDB, couldn’t resist given your user name. Thanks on the info about the GT Utes the W34 option is the one I am thinking of. Definitely a rare bird among rare birds! Amazing that they even had to modify the windshield washer jar for the W34 option! 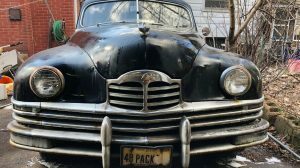 Keep in mind, the W-34 option got you a different cam, larger valves, and different transmission set up, changing the personality of the car more than 25 hp would lend you to believe.